This Sunday morning I finished hike number 11/52 for the 52 Hike Challenge in 2015, and have now completed 92 of my goal of 1000 miles this year. After spending a pleasant evening camping at Islay Creek Campground, I got up early with the sun to hike Valencia Peak. The trailhead to Valencia Peak is just outside of the campground entrance on Pecho Valley Rd. 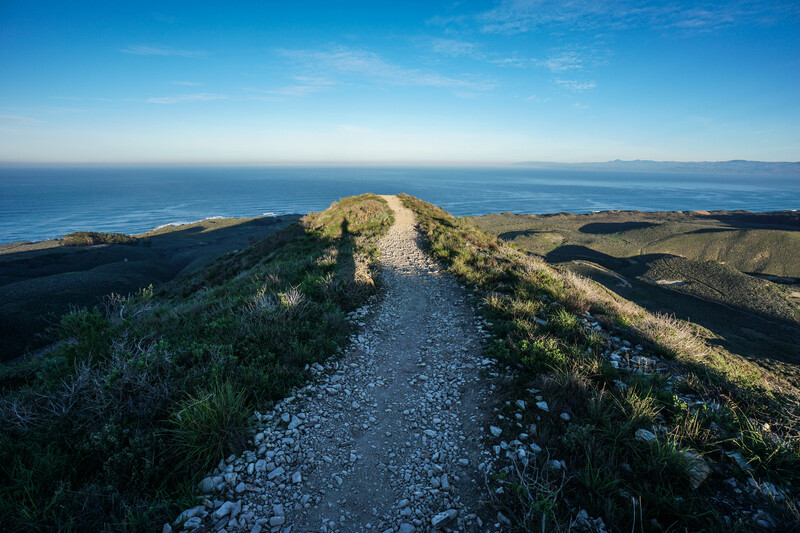 This hike offers incredible views of Montana de Oro, the Pacific Ocean, and Morro Bay, just to name a few highlights. The round trip on this hike is about 4 miles, with close to 1300 ft of elevation gain. The trail to the summit of Valencia Peak starts out gradually through some rolling flat land before making it’s way to the peak, moving between switchbacks and curving paths the entire way. The trail is in great condition, and is mostly gravel and dirt, with larger pieces of broken Monterey Shale mixed in. The most spectacular part of the early going is that the views grow exponentially better as you climb higher. A mile into the hike, I hit a trail junction that told me to go right for the summit of Valencia Peak. I realized that I could have taken the Oats Peak Trail to the Beebe Trail from my campsite, but am glad I didn’t, as these views were much better than the alternate route would have offered. I continued on from the trail junction with a mile of hiking to go and the trail began to grow in steepness. To the left, I could see Morro Rock and Morro Bay waking up to the sunrise just as my own shadow began to shorten with the rising sun. At this point I had yet to see any other hikers on the trail, and realized I would have this peak all to myself for the morning. It’s always a special feeling to be out on the trail by yourself, with nothing but the sound of wind blowing and waves crashing. As the summit of Valencia Peak grew near, I reached the final post reading ‘Elevation 1347 Feet”. This post is actually just below the summit, so I hiked the remaining steps of the trail and took a 360 degree view out over the Central Coast. It was absolutely spectacular. The morning air was crips and refreshing, with a slight breeze blowing from out over the Pacific. The views of Morro Bay were now complete, and looking back east towards SLO made me want to continue on further. I didn’t have time for more exploration on this morning, but I will be back to this area very soon. Morro Bay and Rock are among the most beautiful things I saw during my California life — this hike looks amazing and I love the photo of your first glimpse of the bay. Thank you. I feel like I was along for the ride! Thanks for stopping by, Martha! I was able to live in the area during my undergrad years, and try to visit as often as possible. I agree, it’s one of the more beautiful sights in California!